Sophea**, 11 years old, was a student studying in Grade 6 in Tanou primary school, Tanou commune, Svay Chrum district. She had one sister aged 9 studying in Grade 4. Her mother was widow and she was a farmer. Sophea was an outstanding student. She always got number one in her class. She liked reading books very much. She read story books and textbooks in class and library or do school assignments everyday. She sometimes borrowed books to read at home. Her mother helped her read and teach her when she could not read some words. Sophea said before her school had let’s Read program, she just read a little. But for that year, she read a lot when the program started. “It is so attractive now, I always read books and e-book much more than before in break time, library time and especial in reading club time for 6 hours a week,” she said. She liked reading in let’s Read program because she could use tablets for reading as it was easier to find and select many books in one place as she liked. She said Let’s Read program had many good books, different categories and all are different from her books in library. She liked reading educational books, literature books and story books. She wanted to become a Khmer teacher in the future. 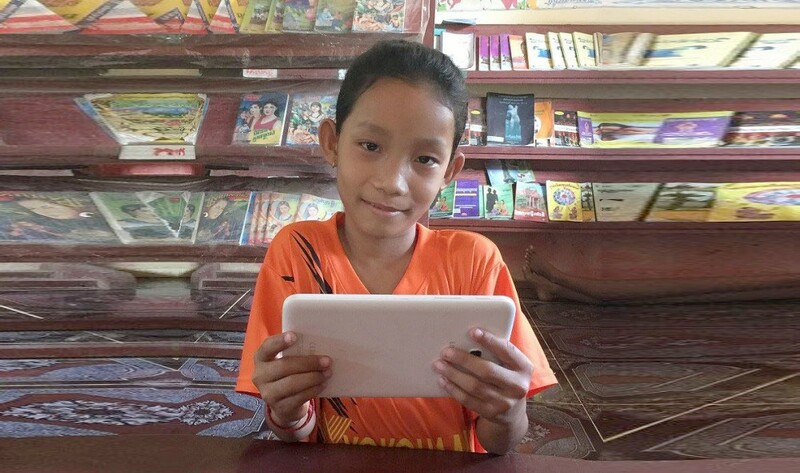 She wanted The Asia Foundation to add more tablets to her school because there are many students wanting to read. She said, “Sometimes, my friends are not happy when they didn’t have any tablets to read. They just listen to others’ reading and the summarized story from friends”. She also asked the Asia Foundation to add more books and Math books. **Sophea is a made up name to protect the child's identity.